The gift of art is very powerful. Many people think of art as a talent, creativity or passion. While this stands true, art can also be a therapeutic medium for calmness and peace. 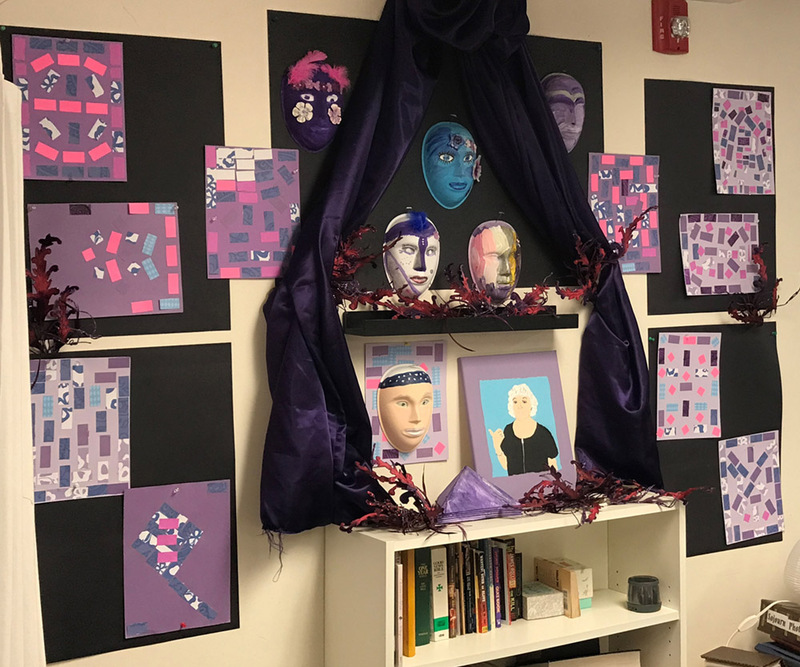 In honor of the Twin Cities Walk to End Alzheimer’s in September, our Sojourner’s came together and created a purple memory wall, dedicated to Alzheimer’s in hopes to spread awareness and celebrate a possible cure. “All participate in the community of art. Seeing, doing and being in the community with others is what the creative process is all about. It’s more about the journey than the end product,” states Victoria, who leads the arts & crafts program Thursday mornings at the day center. Victoria shared how the Purple Art for Alzheimer’s project has made an impact for individuals who have lived with this challenge. Not all can speak and create the art themselves, however, being in the environment and involved is what makes their piece speak for them. It’s more than giving individuals an activity just to keep them busy, art helps stimulate the brain and sometimes, brings back talents that have been forgotten. The peace and joy art provides was exemplified while speaking with a few of the featured artists. Geri, who has been with Sojourn for 3 years now, lost her memory due to a Pancreas disease. “I love being a part of the art program because it allows me to express myself and my creativity.” As a previous Home Economics teacher, the Sojourn art program has allowed Geri to utilize her skills and strengths in ways she didn’t know was possible. “The support and encouragement of not only the Sojourn staff, but my friends here bring me tears of joy,” explains Geri. Art at Sojourn is about experiencing the artistic process. From working with watercolors, painting or cutting and pasting, there are a variety of ways individuals can express themselves through art. “I like that nothing has to be perfect,” explains Vicki, another featured artist of the Purple Wall for Alzheimer’s. Vicki’s favorite part about being involved with the Sojourn art program is that each week there is a different theme. We hope our Purple Art Wall for Alzheimer’s helps spread awareness, together we can make a difference.